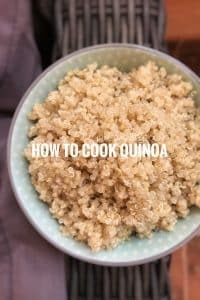 Quinoa Recipes And Cooking Basics | Simple. Tasty. Good. What’s today’s cooking assignment? Let’s talk about preparing quinoa and look at some quinoa recipes this time! By the way: do you know how to cook quinoa the right way? Do you know how to cook quinoa the right way then? Well it’s honestly very simple because here is the proper ratio: 1 ½ cups (360 ml) of water or other cooking liquid to 1 cup (190 g) of uncooked quinoa grains. This amount will give you a generous 1 lb (450 g) of cooked quinoa in the end. I love to use chicken stock but vegetable stock or plain and simple tap water is fine as well for quinoa recipes because the chicken or vegetable stock adds so much more flavor to the cooked quinoa in my opinion. I also like to add fresh herbs to the liquid when the quinoa is cooking: herbs like bay leaves, thyme, rosemary, even lavender I used before! Or a small peeled clove of garlic can also add a lot of flavor to cooked quinoa. Watch my recipe video about how to cook quinoa the right way! Lots of people recommend to rinse the quinoa grains first before cooking them. It would remove the starchy bitterness it appears. Anyway, I have always rinsed my quinoa without knowing if there was a particular reason for it. Just pour the quinoa grains in a fine sieve and rinse them under running tap water. Again, some say hot water – others claim cold tap water is just fine. Did you know that you can cook quinoa in a microwave? 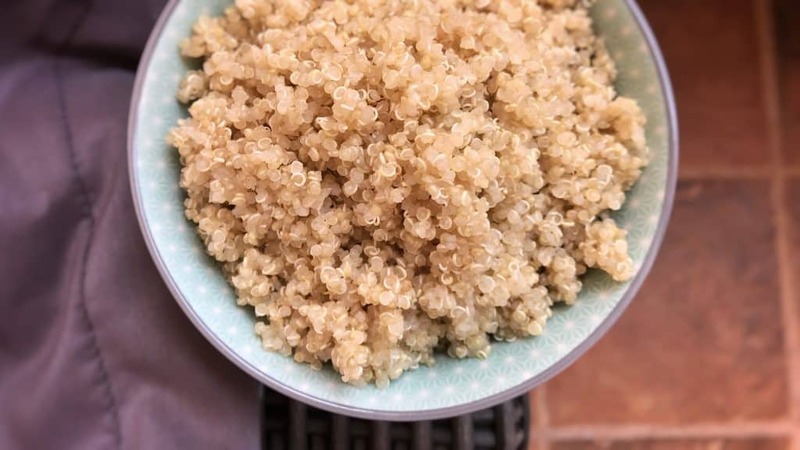 Here’s how to cook quinoa in the microwave! Rinse a cup (190 g) of uncooked quinoa grains first. Then transfer them to a microwave resistant bowl and add 1 ½ cups (360 ml) of water. 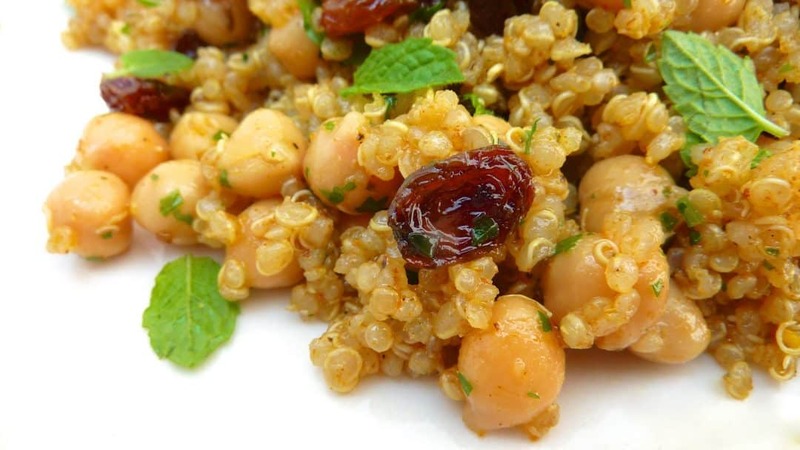 Place a microwave resistant plate on top and cook the quinoa for 6 to 7 minutes on high. Stir the quinoa and cook it for 3 more minutes. The water will steam the quinoa until it is tender and absorbed. You can even cook quinoa in a rice cooker! Here again use 1 ½ cups (360 ml) of water or any other cooking liquid to 1 cup of quinoa grains. There are 3 color types of quinoa: white, red and black quinoa. Which one can you find the easiest around where you live? I have to say that the white quinoa was the very first type I came across but recently the red one is also available now here in Spain. The white quinoa cooks the fastest apparently, followed by the red and black quinoa that need a couple of extra minutes to become tender. Pour the quinoa grains in a sieve and rinse them under cold running tap water. Add the rinsed quinoa grains to a large saucepan together with the olive oil, the bay leaf and the (vegetable) stock or water. Season with a pinch of pepper and salt. Bring all the ingredients to a good boil over medium heat. Let the quinoa cook for about 10 to 12 minutes or until all the liquid has been absorbed. 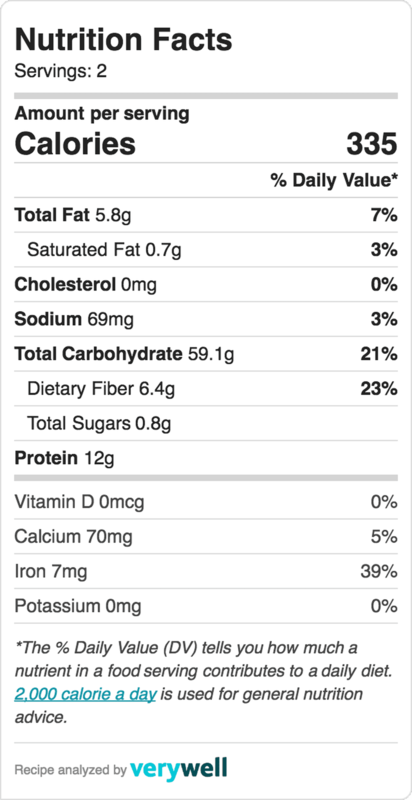 Check the quinoa grains to find out if they are tender enough. Take the quinoa off the heat and serve it warm or add other ingredients. You can also put the cooked quinoa straight away in the fridge to let it cool if you want to use it in a cold salad. OK so here’s one of my latest quinoa recipes then: how about making some crunchy quinoa fritters! These actually remind me of the rice fritters my mom used to make often if we had some leftover cooked rice in the fridge. Cooked rice, cheese, fresh onion, flour, egg, pepper, salt. Make rice balls en fry them until golden. I added some curry powder to add an interesting flavour twist to the fritters. 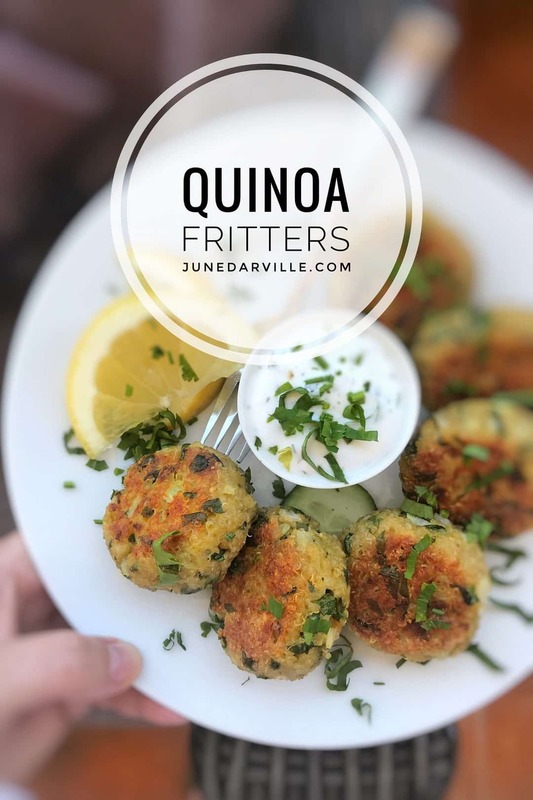 Watch my video of how to make these little quinoa fritters using my fabulous KitchenAid Stand Mixer Mini! Here’s the quinoa version! 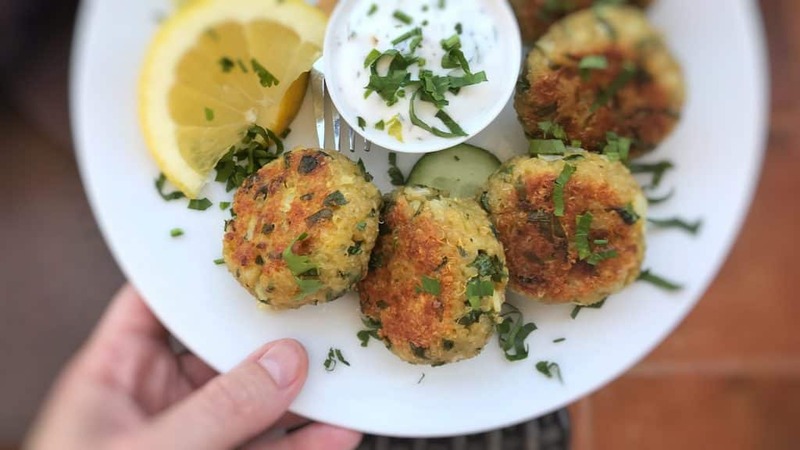 For these quinoa fritters you need about half a cup (95 g) of uncooked quinoa and ¾ cup (180 ml) of water or vegetable stock to prepare the necessary 9 oz (250 g) of cooked quinoa. Combine all the ingredients in a large mixing bowl and season generously with pepper and salt. Mix the quinoa batter well. Then make 6 to 8 even portions of the batter. Roll them into balls and press them gently until flattened a little. Then pan fry or grill the quinoa fritters in a little olive oil on both sides until golden. I made this quinoa nicoise salad thinking I was going to eat it all myself since hubby isn’t very into quinoa (“that’s for birds” he says all the time). But he surprised me by saying he actually liked it when he took a bite of MY salad. Well there’s a first time for everything, isn’t it?! I did keep the quinoa very crunchy and al dente. No mushy mash. I added black olive tapenade to the olive marinade since I had a jar of the stuff in my fridge but you can use chopped black olives instead of course. Enjoy this gluten free summer salad! Pour the quinoa in a sieve and rinse it. Pour the chicken or vegetable stock (or water) in a large saucepan and place it over medium-high heat until boiling. Then add the quinoa. Lower the heat, cover the pan and let the quinoa absorb the water for 10 to 12 minutes. Once the quinoa is tender, put it straight away in the fridge to cool. In the meantime trim and clean the green beans. Also add them to a pan with salted boiling water and blanch them for a couple of minutes until al dente but not mushy. Drain the blanched green beans and immediately refresh them under cold running tap water to stop the cooking process. Then chop the green beans into bite-size pieces. Slice the hard-boiled eggs. Drain the canned tuna and flake it with a fork. Combine the olive oil, the white wine vinegar or lemon juice, the garlic paste and the black olive tapenade (or chopped black olives, optional) in a small cup. Add the cooled quinoa, chopped cherry tomatoes and chopped green beans to a large mixing bowl. Drizzle with the olive oil mixture. Season with a little pepper and salt to taste also. Stir the salad and add the flaked tuna. Check the seasoning and add extra pepper or salt to taste if necessary. Then transfer the quinoa salad onto plates. Garnish with the sliced hard-boiled eggs, the anchovy fillets (and extra black olives if you like). Serve the quinoa salad at room temperature. This beetroot salad was a true success story. What goes into it: cooked quinoa, green lentils, diced cooked beetroot and the freshest apricots. Since my husband started to appreciate quinoa little by little I love making quinoa salads and such for lunch from time to time. Love it! Now my neighbour brought a bunch of fresh apricots that he harvested from the large tree in his garden the other day and I was thrilled. Handfuls of recipe ideas ran through my head at once. This salad made it onto our table for lunch. I also served it as a side for crunchy seared duck and lavender. Yep, you read that well. Great combo, it blew us away. The fresh apricots were so sugary and firm. Not mushy or anything. Highly addictive. Just in case you buy precooked beetroots: they sometimes come with extra beetroot juice. Do add this to the salad as a sort of an extra marinade! It will add so much flavor and color to this salad. All in all this is a great colorful and gluten free salad that contains the necessary crunch and hearty sweetness. You will love it! Pour the quinoa in a sieve and rinse it well. Pour the chicken or vegetable stock in a large saucepan and place this over high heat until boiling, then add the dried green lentils. Cook the lentils for about 4 minutes. Then pour in the rinsed quinoa. Stir and turn the heat lower. Cook the quinoa and lentils for another 10 to 12 minutes. Check the tenderness in the end to see if the quinoa and lentils are cooked enough. Once this is done, take the pan off the heat and pour the lentils and quinoa in a sieve or colander. Let the cooked lentils and quinoa drain well and cool a little for about 5 minutes. In the meantime dice the precooked beetroot up. Do the same with the fresh apricots. Chop the (red) onion finely. Pour the cooled quinoa and lentils in a large mixing bowl and add the diced beetroot. Stir well. Then add the diced apricots. Season with a little pinch of pepper and salt. Drizzle with a little olive oil. If you have any beetroot juice left, you can add this to the salad as well. Stir the salad well again. Sprinkle with the freshly chopped red onion and the chives. 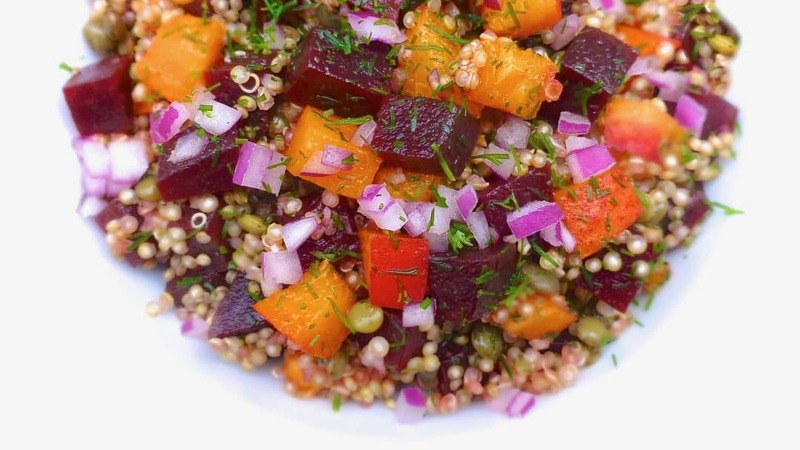 Stir the quinoa and beetroot salad well. Check the seasoning and add extra pepper, salt or olive oil to taste if necessary. Serve the salad at room temperature. If you are a huge fan of blue cheese, than there’s no doubt in my mind that you will adore this beautiful quinoa soup! It’s got quinoa of course in it but also bits of creamy blue cheese, some freshly chopped spring onion and a handful of shredded cooked chicken to make it more filling. I don’t know about you but for me there’s something about that combination of blue cheese and spring onion that I love so much. For some reason those two go so well together if you ask me. What started off as a simple quinoa and chicken soup ended into something far more exciting the minute I threw in those bits of creamy blue cheese. It’s quite interesting to see how it melts away in the hot soup. Blue cheese has this very strong and almost nutty flavor and that’s just what this quinoa chicken soup needed. And it’s salty. That’s why I did not want to use chicken stock here, not even a pinch of salt. The blue cheese will take care of that. Serve this gorgeous quinoa soup piping hot. It is great to serve as a wholesome, gluten free and filling lunch soup! Pour the water in a large saucepan and place it over high heat until boiling. Then turn the heat lower and add the chicken breast. Let the chicken poach in the hot stock for 10 minutes. Turn the heat off and let it poach for another 5 minutes. Then remove the chicken and transfer it to a clean plate. Put it aside to cool down fully until needed later. Place the hot chicken stock back over medium heat and pour in the quinoa once boiling again. Stir and cover the pan. Cook the quinoa for 12 minutes until nearly tender. In the meantime shred the cooled chicken up. Add the chopped garlic and cooled shredded chicken to the cooked quinoa soup. Stir and cook the quinoa soup for 3 more minutes. Then add the crumbled blue cheese to it and season with a little pinch of pepper to taste. 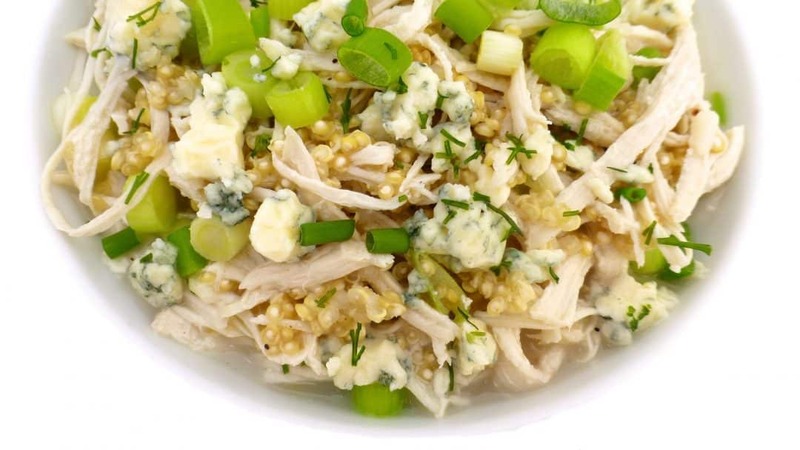 Let the creamy blue cheese melt in the quinoa chicken soup for a couple of minutes. Trim the fresh spring onions and slice them up finely. Add them to the soup as well. Take the soup off the heat once the quinoa is tender. Check the seasoning and add extra pepper to taste if necessary. Scoop the soup into deep bowls. Serve the quinoa piping hot. Lookee here! 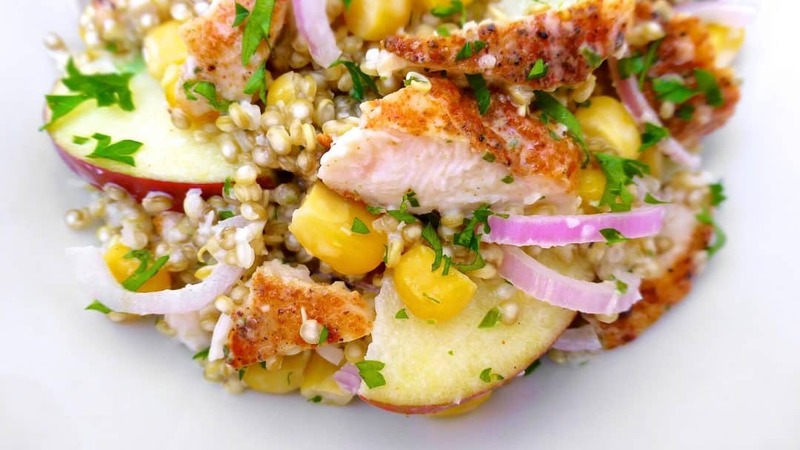 An easy gluten free chicken salad recipe with… quinoa! Let’s call it a strike ’cause the hubby liked it again! I made a pumpkin quinoa salad and a quinoa nicoise salad a couple of weeks ago so I thought it would be time for another crunchy ‘birdseed’ dish. So here is my fridge loot so far: a few strips of grilled cold chicken from yesterday’s roast chicken dinner, half an apple (what was left after making a delicious classic apple pie last weekend), a jar of freshly homemade ranch dressing and half a tin of crunchy sweet corn. I cooked a handful of quinoa in the morning and let it cool down. Just throw it all into a large mixing bowl, stir, season, taste. And you’re all set for a gluten free quinoa lunch salad! Pour the chicken stock in a large saucepan and bring it to a rolling boil. Then add the quinoa. Stir and simmer the quinoa for about 10 minutes or until tender and cooked through but not too mushy. Transfer the cooked quinoa to a colander and rinse it well under cold running tap water to stop the cooking process. Let the quinoa drain and cool until it reaches room temperature. In the meantime peel and slice the shallot. Core the apple and chop it up into bite-size chunks.Transfer the cooled quinoa to a large mixing bowl and add the drained canned sweet corn. Stir well. Add the lemon juice or lime juice, the chopped shallot and apple. Shred the leftover grilled chicken and add it to the bowl as well. Season with a little pinch of pepper and salt. Stir well and pour in the ranch dressing. I’m a huge fan of fried rice but have you tried ‘quinoa fried rice before’? 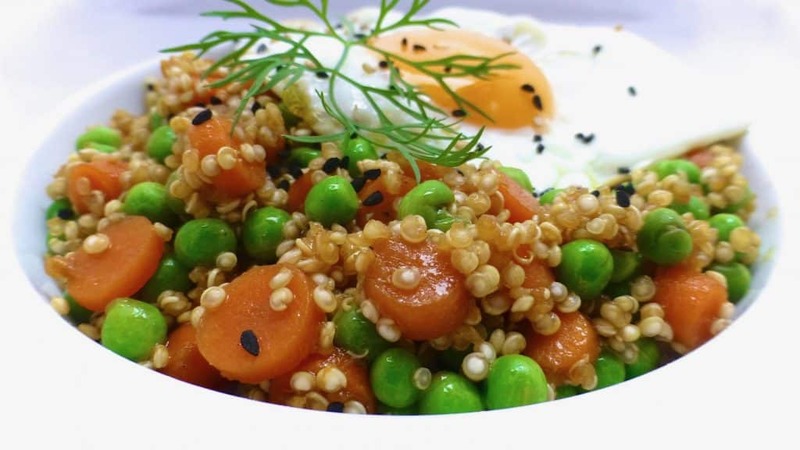 It is basically stir fried quinoa with the classic carrots and peas. I added freshly grated ginger, soy sauce and hot chili sauce to it to give this quinoa bowl some extra Asian punch. And that fried egg on top… heaven. Just goes without saying. 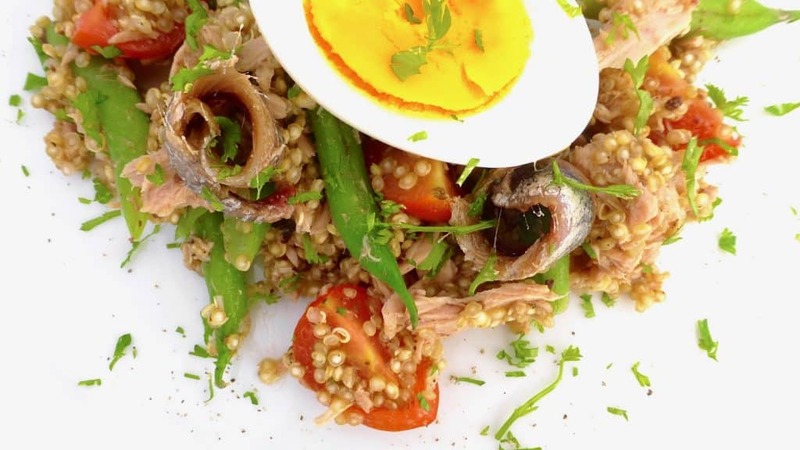 I just love it when that gooey egg yolk breaks and adds that creaminess to the fried quinoa. My initial idea was to scramble the eggs in the beginning, chop them up and add them to the fried quinoa but in the end I went for a gorgeous fried egg. Looks spectacular and savoury as well! Pour the vegetable or chicken stock in a large saucepan and place this over high heat. Once the stock is boiling, pour in the rinsed quinoa. Stir and turn the heat low now. Cook the quinoa about 10 to 12 minutes. Check regularly to see if the quinoa is tender. It should be cooked through but still a little crunchy, not mushy. Once this is done, take the pan off the heat and pour the quinoa in a sieve or colander. Drain the quinoa and immediately rinse it under cold running tap water to stop the cooking process. Let it cool down a little. In the meantime mash the garlic and the shallot under the blade of your knife until you get a mushy pulp. Pour 3 tablespoons of the olive oil in a large non-stick pan and place it over medium heat. Once the oil is hot, add the freshly grated ginger and the shallot and garlic mash to the pan. Quickly stir fry the garlic and shallot for a minute until fragrant. Then add the drained cooked quinoa to the pan as well. Stir well again and fry the quinoa for 5 minutes. Make sure the quinoa doesn’t burn. Then add the sliced carrot and the frozen peas. Cook the ingredients for another 3 minutes. Season the fried quinoa with the hot chili sauce and the soy sauce. Also add a pinch of salt to taste. Stir well again and take the pan off the heat then. Put a lid on it and let the quinoa and peas rest for now. In the meantime fry the eggs in the remaining olive oil. Right before serving check the seasoning of the quinoa and add extra soy sauce, salt or hot chili sauce to taste if necessary. Scoop the quinoa fried rice into bowls and top with a fried egg. Serve hot. 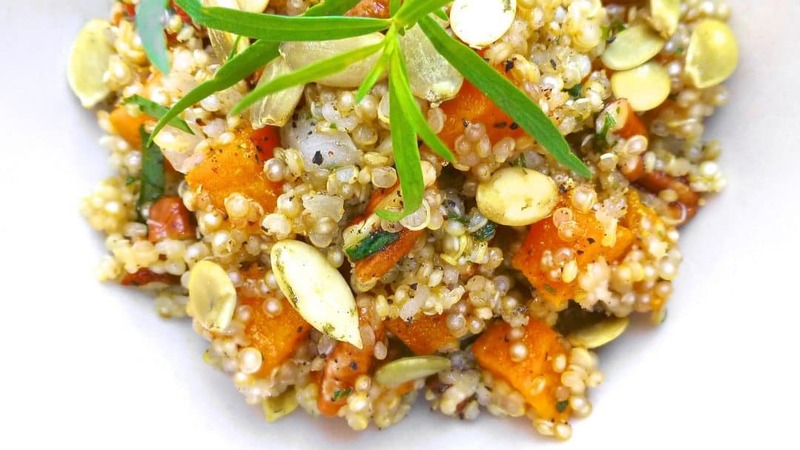 Another delicious gluten free Thanksgiving side dish: roasted squash and quinoa salad. And the flavors are fantastic because it’s packed with sweet squash, fresh tarragon, honey, lemon juice, creamy pecan nuts… Crunchy onion and pumpkin seeds complete the whole picture. It’s the first time that I use honey in a dressing actually. I’m not a huge sweet tooth but I must admit that the sweetness is just perfect in combination with the other ingredients here in this salad, especially the squash. Dice the squash into small bite-size cubes. Transfer them to a baking tray. Sprinkle with olive oil, pepper and salt. Roast the squash in a preheated oven at 356°F (180°C) for 20 minutes until almost soft. Stir the roasted squash about halfway through cooking time. In the meantime pour the quinoa grains in a sieve and rinse them under cold running tap water. Bring the vegetable stock to a good boil in a large saucepan over high heat and then add the rinsed quinoa. Stir and turn the heat to medium-low. Let the quinoa swell and cook for 12 minutes until more or less tender. Pour the cooked quinoa through a sieve and refresh it under cold running tap water to stop the cooking process. Let the quinoa cool fully. Transfer it to a bowl. Add the roasted squash. Stir and add the pecans, pumpkin seeds, chopped onion and tarragon. Stir the quinoa salad. In a separate cup add 5 tablespoons of olive oil, the garlic paste, lemon juice and honey. Whisk the marinade well and add it to the quinoa salad. Season with a dash of pepper and salt. Stir the salad well. Then check the seasoning and add extra pepper, salt or lemon juice to taste. Serve the salad at room temperature. Do you cook a lot with curry madras? After making this curried and gluten free quinoa salad I kind of rediscovered that gorgeous spice again. It’s always in my spice rack but it doesn’t end up that often in my recipes. Here in combination with the crunchy cooked quinoa and the crisp green cabbage it tastes wonderful. That egg crumble was more like a last-minute idea and so were the poppy seeds. Pour the vegetable stock in a small pan and place it over medium-high heat until boiling. Then pour in the quinoa. Turn the heat low, cover the pan and let the quinoa simmer and absorb the hot stock for a couple of minutes. Then let the quinoa cool down fully. In the meantime peel the egg and transfer it to a blender. Blend it for a couple of seconds until you get a rough crumble. Put the egg aside until needed later. Then pour the olive oil in a small non-stick pan and place it over medium heat until hot. Gently fry the green cabbage for 5 minutes until warmed through but still crunchy. Remove the fried cabbage from the heat and let it cool down. Then pour the cooled quinoa in a medium mixing bowl together with the poppy seeds and curry madras. Also season with a pinch of pepper and salt. Add the cooled cabbage and cream cheese. Then stir well. Also add the egg crumble and the chopped red onion to the quinoa. Stir the salad again. Check the seasoning and add extra pepper, salt or curry madras to taste if necessary. Serve the quinoa salad cold. 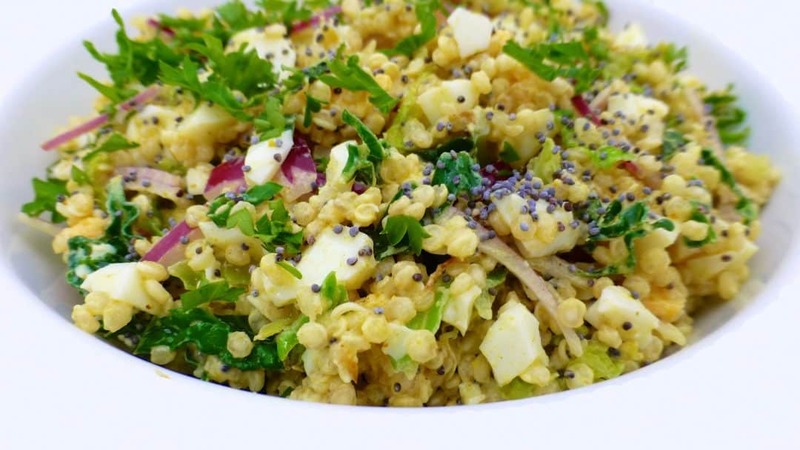 This very easy quinoa salad recipe is just lovely! And if you’re even more fond of oriental spices and flavors, stay right here because this is what you’ve been searching for. It’s the combination of the garam masala and the curry powder that makes this easy salad irresistible. A real flavor explosion! I stirred in some chickpeas because that adds crunch and creaminess and a handful of black raisins (you can use golden raisins as well) to add a sweet touch. This quinoa salad is a perfect side dish for roasted lamb by the way! Pour the water in a high pan and place it over high heat until boiling. Then turn the heat back down to medium-low. Stir in the quinoa and cover the pan. Let the quinoa cook for 10 to 12 minutes or until the water is fully absorbed and the quinoa is tender. Stir regularly. Remove the pan from the heat and let the quinoa cool at room temperature. Then carefully fluff it with a fork to avoid lumps. Put the cooked quinoa in the fridge for 30 minutes. In the meantime combine the olive oil, curry powder and garam masala. Season with pepper and salt. Chop the fresh mint finely. Drain the chickpeas and rinse them under cold running tap water. Transfer the cooled quinoa to a large salad bowl. Drizzle it with the garam masala oil dressing. Add the chopped mint, drained chickpeas and black raisins. Stir well. Check the seasoning and add more pepper or salt to taste if necessary. Divide the quinoa salad over plates. Serve cold.